How to measure place branding impact is a question which often leads to discussion and which we have addressed before. 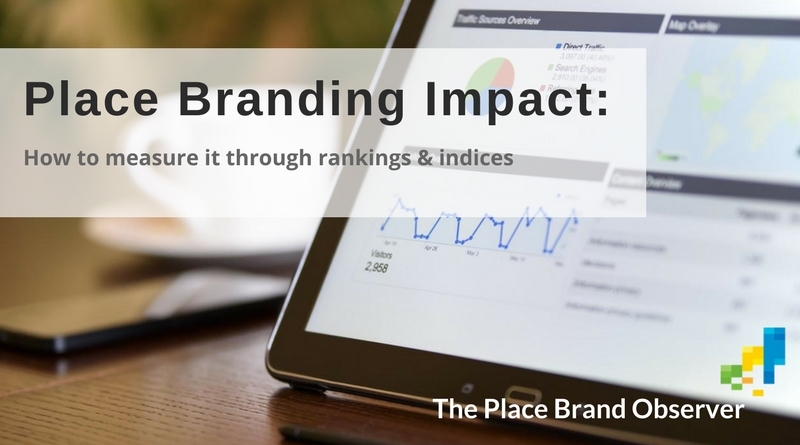 In this post learn which place brand rankings and indices exist and how they can help you determine whether the branding strategy of your city, region, destination or country is making a positive difference. This overview of place brand rankings and indices is based on the presentation by place reputation advisor Robert Govers at the City Nation Place Forum 2016, which took place in London last November. For impact measurement and rankings, Govers distinguishes between the host (supply) and the guest (demand) side. Place identity, product offers and marketing communications are three main aspects to keep in mind when measuring and monitoring the impact of place branding efforts. Benefits of using indices and rankings for measuring impact of city, destination or country branding initiatives are the reduced complexity of those rankings, which makes it easier to communicate to policy makers and the general public. Moreover, indices and rankings facilitate a longitudinal comparison – tracking place brand performance over time. Some of the aspects which might limit the usefulness of rankings for determining the success of place branding include validity, simplicity, methodological flaws, misuse and bias, for instance if such indices are produced by consultancies with the purpose to attract new clients. Found this overview of place brand rankings and indices useful – or know someone who might benefit from it? Share and spread the word!